I'm no gardener, but I actually managed to grow apples. Proud moment. Yes! 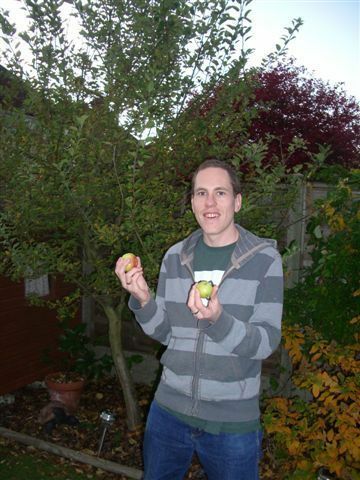 Incredibly, I planted the tree you see behind me in this photo and it actually produced two apples this year. I was 6 years old and saw an episode of Blue Peter about planting trees. I decided to pot the next apple seed I found indoors, and surprised my family when it grew six inches seemingly overnight. From there it moved to the garden, and despite being re-located three times it has managed to grow to just over 9 feet tall. This year is the first that I've seen it give me... I'm really not an expert but I think they're Braeburn apples. Definitely won't be joining a gardening club, watching Alan Titchmarsh or spending time AFK to sit with my tree any time soon. But it's cool to sit in the warm and know that outside my window is something I planted and it actually did more than just survive. Kudos mother nature. Yesterday I had to take my dog to the vet for surgery on his ear. He had grass seed stuck down there, it had pierced the ear drum and become infected. Poor guy. Today he's feeling much better having recovered from all the sedatives and injections with a decent night's sleep. 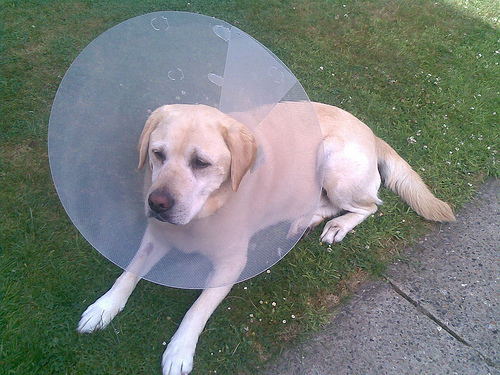 There are some photos of him looking miserable in a giant cone-shaped protective collar on my Flickr account. Once he's taken the course of antibiotics and steroids he'll be back to full health, free to play football and eat apples. 1. Trust your instincts If the dog barks at someone, it shows his instincts are telling him they are not to be trusted. Over the years, this instinctual judgement of people has proved remarkably accurate. He's unable to formulate elaborate plans with his limited capacity for thought and is solely guided by instinct, but this seems to work quite well. 2. Actions speak louder than words Dogs can't talk, shame. That doesn't mean they can't communicate. Some of the facial expressions and gestures that my dog makes couldn't be made clearer with words, and the way in which we interact is based around action rather than words. This has made me incredibly aware and critical of the way in which I communicate with others, I can say less and convey more. 3. The carrot is better than the stick You can either motivate people by being aggressive or rewarding them. In the long term, a fair reward system works best as it will form a relationship built around trust and mutual respect. 4. Every action has an equal and opposite reaction If you over-feed a dog, a walk in the park is going to take longer as there will many more answers to the call of nature. Similarly, if you train for the command "fetch" to include mauling the object, don't expect to be able to use that for retrieving items intact. 5. If you've got lemons, make lemonade I gave the dog an IQ test. The test was a cube with a simple maze inside and food at the centre. Normally, dogs push the cube in different directions to shift the food around the maze until it falls out the exit hole. My dog has big teeth, a powerful jaw, and a small brain. He showed that he knew his strengths and limitations and worked with them - he destroyed the cube to get to the food. 6. Fool me once, shame on you. Fool me twice, shame on me Sometimes we play games where I will hide his toys and help him find them again. I can only use a hiding place once, he'll remember them the next time and visit them first. If I've not used a location in a long time and we find it there, he remembers and gets annoyed at himself and me for not visiting that place straight away. 7. Variety is the spice of life But variety is only fun to experience if your life is based around routine. The dog knows his day-to-day schedule for meal times, walks and naps. 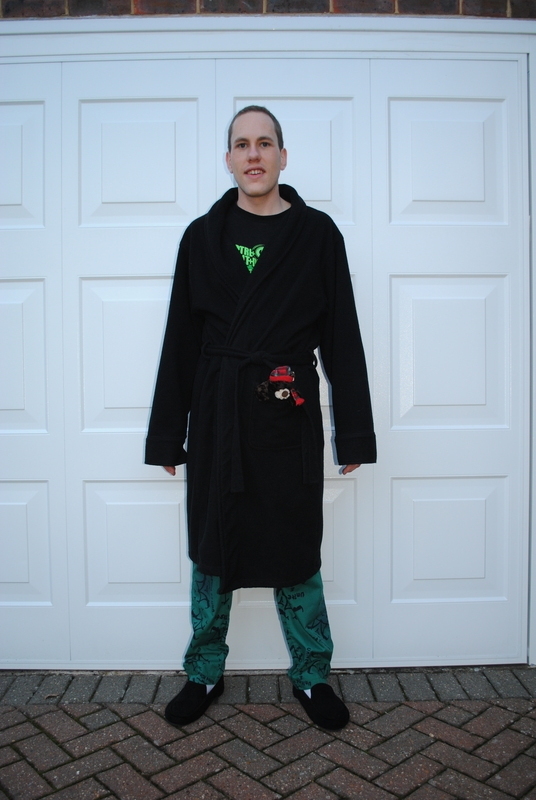 He enjoys mixing things up once in a while by trying to exercise those habits when staying at a friend or relative's house. 8. Keep it simple On a camping trip, the dog worked like a Trojan and dragged massive logs from where I was cutting them back to the fire pit. He had one simple task to perform and did it brilliantly. The process stopped when someone else tried to add extra roles to his return journey. 9. You can lead a horse to water, but you can't make it drink This applies to dogs too. 10. Some rules are made to be broken There are strict rules that the dog abides by at home. These include not climbing on or destroying any furniture, not going upstairs, and not begging for food from the table. He is not supposed to take any of his toys in the living room and play in there because of the carpet, leather sofa and various breakables. Over the years there has been a constant battle to keep the toys out. But by focusing his attention on trying to defy this one rule, he is prepared to embrace every other rule. Some of these lessons are akin to an Aesop's fable, but how useful is theory without witnessing a practical application of it? I certainly feel I've gained wisdom and a greater tacit understanding of life from having a dog. I challenge cat owners to prove they can say the same. Keep your cheeseburgers.